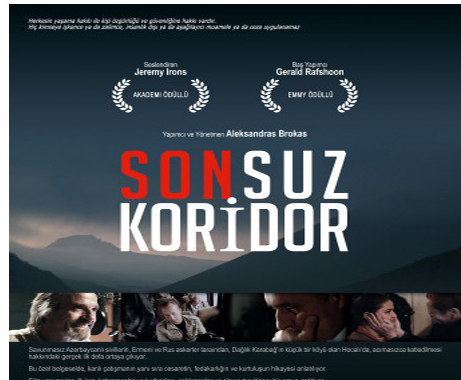 Documentary, "Endless Corridor" was showcased by CNN Turkey, the European Azerbaijani Society (TEAS) said. The film was translated into Turkish as part of the Justice for Khojaly campaign initiated by Leyla Aliyeva, Vice-President of the Heydar Aliyev Foundation. As part of the Justice for Khojaly campaign, the presentation of "Endless Corridor" has been held in Istanbul, Ankara, Rome, Vilnius, London, Paris, Dublin, Berlin, Bern and Luxembourg. Being originally in English, the documentary was translated into Azerbaijani, Turkish, French, Italian, and German for subtitles. Narrated by renowned British actor Jeremy Irons, the documentary includes memorable video materials from the meetings of Lithuanian journalist Richard Lapaitis, an eyewitness of the Khojaly tragedy and another survivor of the massacre who some 20 years later to return to Azerbaijan. Those stories tell of the historical and cultural importance of the Nagorno-Karabakh region for Azerbaijan. The film refers to some new facts, documents and footages and photos about the Khojaly genocide. The realities of the massacre are conveyed to the viewers in an impressive way. The Khojaly genocide was committed by the Armenian armed forces. Some 613 civilians mostly women and children were killed in the massacre, and a total of 1,000 people were disabled. Eight families were exterminated, 25 children lost both parents, and 130 children lost one parent. The documentary will also be displayed on other TV channels over the coming months.